Field shelters are a necessity for most horse owners who have their horses turned out, especially if they have limited or no natural shelter in the field. Man made shelters usually come as a 'shed like' structure which, if poorly constructed or situated in the wrong spot, can fall prey to strong winds and leaky roofs. One company, 'Pan Products Ltd' have come up with a clever idea for a totally new concept of field shelters. Forget shed shaped shelters..introducing the world's only two sided building that can withstand impact of horses and 80mph winds! Equine Scientists and the National Trust have helped develop the new Horse Arc with Pan Products, who are based in Lincoln. What is a Horse Arc? Its an arc shaped, open ended field shelter, which can be built to a size you need for your horses. The arc is open ended, which means horses feel more comfortable entering the shelter, they don't feel as closed in, which goes against their natural flight instinct. It also avoids the danger of a member of the herd being trapped in a shelter and injured by another horse. It also easily accommodates more horses in a smaller space, similar to a herd of horses all sheltering under a tree. What you don't want is a shelter which will get damaged in the wind and scare or even injure your horse. Try getting them to use the shelter then! The unique arc design makes it extremely weather resistant because the rain and snow simply slide off the sides, with no guttering required and no need to re-felt your shelter after high winds. The wind flows over the smooth arc shape rather than hitting a solid wall straight on. The arcs are secured to the ground using concrete blocks. We all want to protect our lovely countryside, but PP can be a real pain sometimes!The Arc is classed as a temporary structure and can be moved, so PP isn't required. 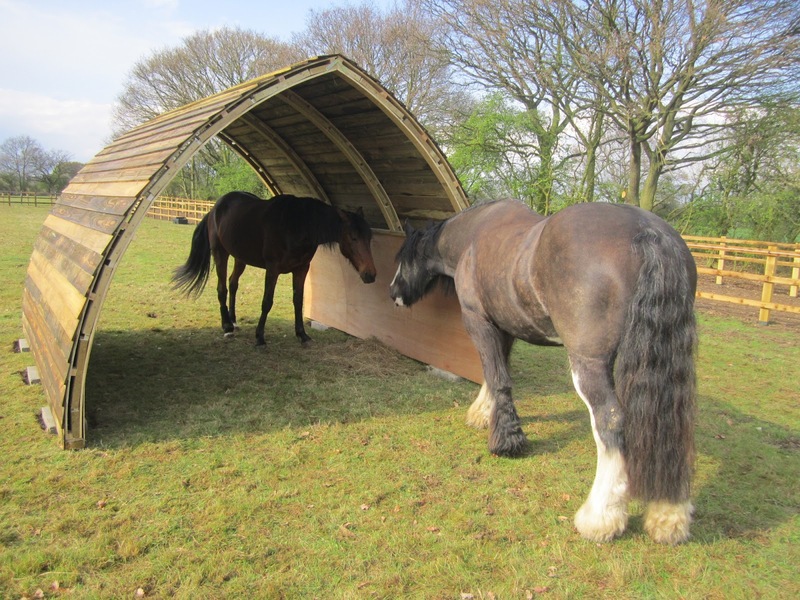 The arcs are lightweight compared to a traditional horse shelter and easy to move. You simply unscrew the arc at its centre so that it is in two pieces. You then get a group of willing volunteers to help carry the arc sides to your next spot. The clever designers at Alfresco Arch have recently added a new towing system to the arc as an optional extra. For just an extra £200 you get wooden skids, a detachable towing bar and Eco Grid track to lay down in front of the arc. This makes it easy to move the arc across muddy fields, no more waiting for the ground to dry up!